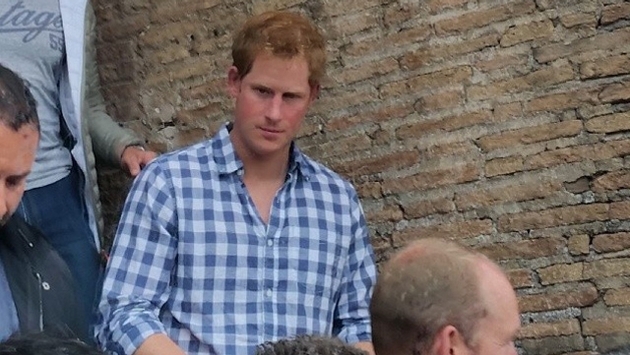 Prince Harry made a surprise appearance at the Colosseum in Rome on Monday, May 21, wearing a blue-and-white checkered shirt and a pair of jeans. The 29-year-old royal checked out the historic landmark with other sightseers. Harry, who reportedly paid his own admission and that of his staff, was shown the Colosseum by guide Laura Cignoni, E! News reports. The visit came one day after Harry went to the Commonwealth war cemetery in Monte Cassino. While there, he joined veterans and dignitaries from around the world to commemorate the sacrifices made by Commonwealth and Allied troops in Italy during World War II. Harry's visit to Italy comes soon after his trip to Estonia last week, where he made an official appearance at Freedom Square in Tallinn to meet with Estonian Minister for Defense Sven Mikser. During the visit, Harry laid a wreath at the War of Independence memorial and observed a minute of silence to pay tribute to those who died in Estonia's War of Independence, which occurred almost 100 years ago. Shortly before that, Harry traveled to the States, where he partied hard in Miami, and then watched a close friend get married in Memphis, Tennessee. Prince Harry is quite the jet setter!